Kulfi is the famous Indian ice-cream served by most Indian restaurants all over the world. It gets its special texture from the small bits of milk-skin that comes from simmering the milk slowly in an open wok. Traditionally, Kulfi-wallas used to freeze it in little earthenware or terracotta cones, with earthenware lids sealed in place with dough. It was then frozen in old fashioned ice-cream makers using a mix of salt and ice, to lower the temperature enough to freeze. You can make it in any container in your home freezer. It is served with Falooda or on its own. This falooda is different from the falooda drink popular in Mumbai. Also see Kulfi 2, Kulfi 3 and Mango Kulfi. Makes approximately 10 kulfi cones. Soak pistachio and almonds in hot water, leave for 1/2-1 hour. Hot water loosens the skin. Peel the skins off. Slice thinly or chop in a nut chopper. Do not put in food processor, it will make them too fine & paste like. Boil milk in a wok/karahi/kadahi, until it is reduced to half. You must keep stirring it regularly. If it catches or burns, you have to throw away the whole amount because the smell of burnt milk is rather unpleasant. A heavy bottomed pan or wok works better, as milk is less likely to catch. Keep scrapping off the milk-skin from the sides and bottom of the pan every few minutes and putting it back in the simmering milk. It is this skin that gives the kulfi it's distinctive, rough texture. Dissolve corn flour and semolina in 3-4 tbsp. of cold milk or water. Add this, sugar, saffron and cardamom powder to the milk. Stir continuously and boil for a further 5-10 minutes, until the mix thickens like custard. 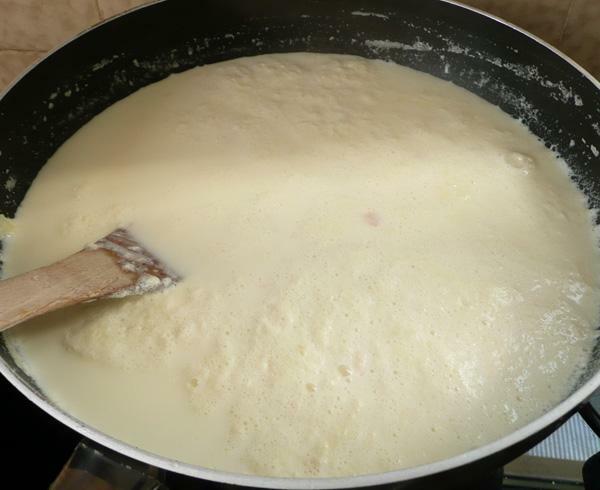 If it is too thin, add a little more corn flour dissolved in cold milk and cook for a further 5 minutes. Add chopped almond powder and pistachio. Whisk double cream until thick and fluffy, add to the cooled condensed milk, and fold in gently. I usually omit the cream. 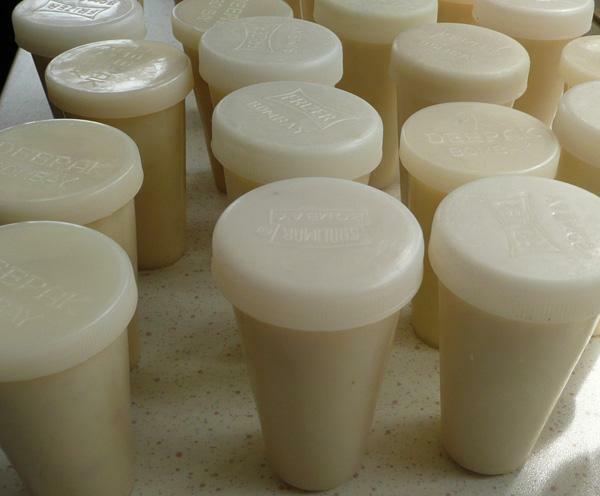 Freeze in Kulfi moulds or in any airtight container. If you have an ice-cream maker, use that. It will give you a much softer Kulfi. It is traditionally quick frozen in a mix of salt and ice (at low temperature of -20 C). This temperature is difficult to reach in normal home freezer. 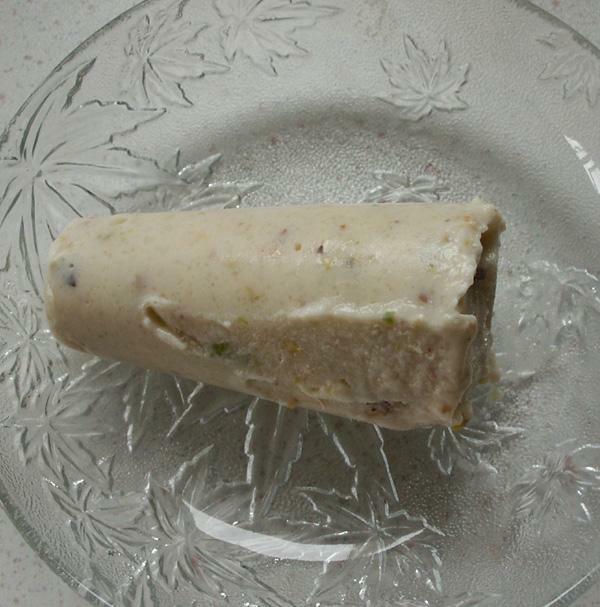 Kulfi is eaten when it is slightly melting on the outside/edges. 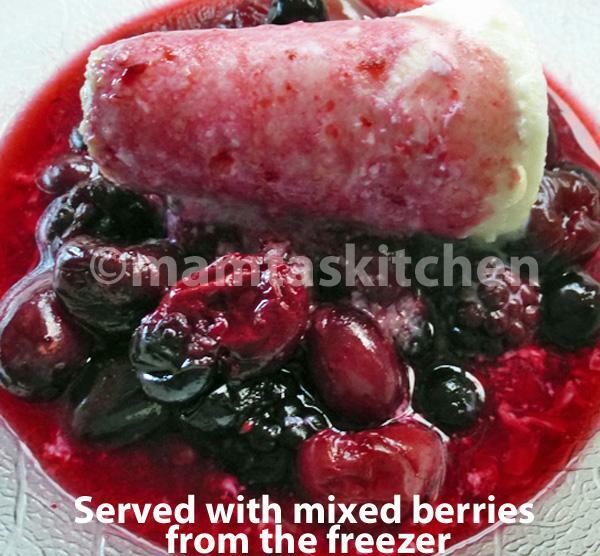 So, take out of the freezer 10-20 minutes before serving, less in hot countries. If you dont have time, either stand the moulds in a bowl of hot water for 10-15 seconds or microwave on full, for no more than 10-15 seconds. 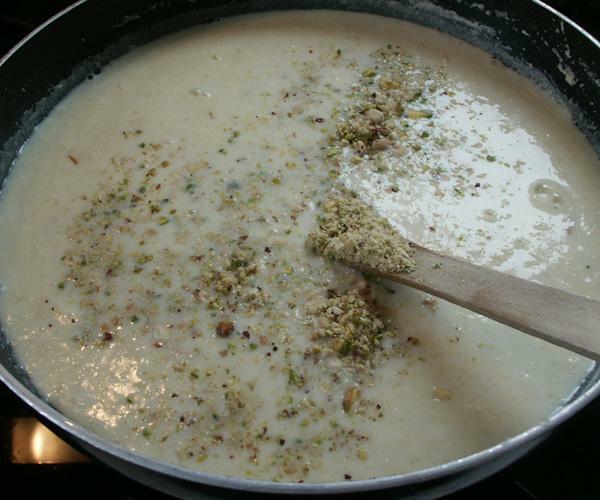 Using a knife, ease each kulfi out onto the plate. Serve with Falooda or on its own. It can also be served with fruits. Chocolate flavoured Kulfi; add 3 tsp. cocoa powder dissolved in 2 tbsp. of cold milk, along with cream. For a sugar free version, use sugar free sweetener, instead of sugar. Add it after the condensed milk has cooled down.